The Taxicab, Limousine & Paratransit Association (TLPA) named Thomas P. Arrighi, President of A&A Metro Transportation in Bridgewater, Mass., as its 2009 Paratransit Operator of the Year, during the TLPA's annual convention held in Las Vegas earlier this month. 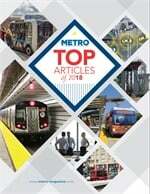 In a highly competitive field of applicants for the award this year, Arrighi and A&A Metro Transportation exemplified the award criteria for attention to safety, superior service and community involvement, according to the Association. “This is a company and a leader that believe in the highest quality service, in rewarding the efforts of workers, and in being an active part in the community,” said Alfred LaGasse, CEO of the TLPA. The company was started as Bill’s Taxi in 1952, operated by Arrighi’s parents, Bill and Dorothy. Arrighi bought the company from them in 1987, and expanded into paratransit services that first year after buying his first wheelchair van and winning a contract to transport school children. The company now has a fleet of more than 100 vehicles, 40 percent of which are ADA accessible, and provides 685,000 passenger trips each year. Community involvement is a key belief with Arrighi. He is an elected member of the Town of Bridgewater’s Recreation Department, and for 20 years served on the YMCA’s Board of Governors in East Bridgewater. Along with his brothers and family, Arrighi has organized the annual St. Thomas Aquinas Charity Golf Tournament for the past 11 years, raising $150,000. He was named 2004 Citizen of the Year by the Bridgewater Rotary Club. In addition, the TLPA named Adepegba “Tony” Abiodun driver for Challenger Transportation of Gaithersburg, Md., the 2009 Paratransit Driver of the Year. “He takes enormous pride in his job, in his service, and in positively affecting the quality of someone else's day,” said the TLPA's LaGasse. Called “the epitome of a professional driver” by his supervisors, Abiodun has earned such a reputation for on-time reliable service that his clients will call the company just to double-check that he's on duty that day. One elderly woman who came to depend on him for regular hospital trips even requested that, when she moved into a new care facility in a different town, he be allowed to change his area of operations. Born in Lagos, Nigeria, Abiodun came to the U.S. in 1986 “in search of a better life,” he said. He received a degree in electrical engineering from the University of the District of Columbia in 1994, and is now a U.S. citizen. He became aware of the needs of people with disabilities when he was assistant store manager at a pharmacy. It was also there that he began to see Challenger vehicles bringing people to the pharmacy. He submitted an application and became a vehicle operator in 2002.